Greetings! Once again, it’s been a while. The past two years I have done some form of my own NaNoWriMo, usually having to do with art, but this year I decided to officially participate and see how I would do! All I really did in preparation for NaNoWriMo was work on plot solidarity and character information. I drew some characters to have a better feel of their appearance and also to have something to glance at when writing those characters to keep their voice in character and such. I made sure my family knew that I would be participating so they would know beforehand why I wouldn’t be interested in going places too often. I also looked at my word counts of things I’ve written before–one of them is a fanfiction featuring my character Urami, which has more than 50,000 words and is only 20% done…but has been written over the course of two years. I knew, however, that if I was passionate about what I was writing and didn’t worry too much about editing, I would be able to write a greater volume in a short amount of time. My family was very supportive and excited that I would be participating in NaNoWriMo, especially my mom, who pretty much chose what I would write for me because ever since I created Enko she has really liked her and wanted me to write her story. So that’s what I did! 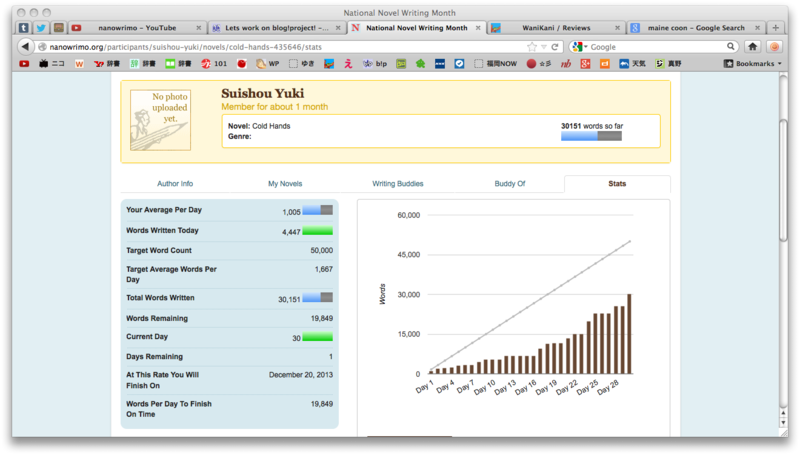 I finished out November having written a total of 30,151 words, not including plot notes. Why is that so exciting, even though I didn’t win NaNoWriMo? Because all the other times I have tried to write original stories, I got stuck at the opening sentences of the second chapter and couldn’t write any more. The story virtually died. Others never made it past plot bunny stage. But with this story, I’m currently in chapter 10, with at least two more chapters to go, plus the epilogue. To me this is amazing. I’ve remained excited about the story pretty much all month, and managed to write scenes I didn’t think i would be able to pull out of myself or had been inclined to procrastinate on. It’s been an amazing experience, albeit a slightly tiring one, and I am really glad I decided to participate for real this year. I think one of the reasons I was able to write this much of an original story for the first time was because I had so much of it planned out in Evernote already. This has been something “coming” since this past summer at the very least! Past attempts at writing original stories consisted of me coming up with all of it as I went, or “pantsing it” as that is called in NaNoWriMo. Clearly I am a planner! I was really grateful not only for my family’s support and encouragement, but also the encouragement from the NaNo staff themselves! They’ve been running it for so long they really know what advice to give you at just the right time, and as it’s a constant stream of encouragement, it really helps to keep you going when it feels like you’re dragging through. I did participate in some local write-ins, though I only went to two physical ones and maybe three virtual ones. For me, it was helpful in the beginning, being surrounded by everyone who was also going for the same goal, but especially with the virtual write-ins (which take place in a chat room), it was easy for me to get distracted, so after the initial start-up I didn’t bother attending so many. I found that with the chat room, I had to cover it up completely with Evernote so I couldn’t even see when new messages came in and I could focus entirely on writing. Others agreed this was a good idea, but of course that meant I often missed when word sprints started and was quite late replying to questions posed to me. I think it’s helpful in the beginning and end of the time you’re doing it for, because again, you have other people “with” you doing the same thing, and you can get tips, ideas, and encouragement as you need it. I wrote entirely in Evernote. I have a notebook with the same title as my story, and each note within it pertains to plot, setting, characters, references, old information, a chapter-by-chapter general outline, and of course the chapters themselves. Each chapter is its own separate note. Writing in Evernote is really convenient because you have your story wherever you go! I was able to write in my room, at a football game, in the car, at the Panera Bread write-ins I went to…anywhere. But because it was more work, the thing I started doing, especially in the final week, was to write new words in a different color (usually purple). This way I could clearly see what I had written each day, without having to wonder how many words I was at. Why? Because what I did next was copy and paste only the colored words into Pages (the Mac equivalent of Word) and check my word count there. This helped me save a bit of time and I could better reach my daily word count goals. At the end of the day, I copied everything into the official validator as usual; actually, the only time Pages’ word count differed from NaNo’s validator was once when I forgot to delete one of my in-line notes, so I think it was a pretty good system. :3 Writing in color was pretty refreshing too, as it was something other than black and white! I think where I’ll go from here, as far as it relates to my light novel, will be first to finish it, and then send the first draft to my friend Michael to beta read for me. After I make necessary edits, I’ll have my mom read the second draft, and then the third draft I can send off for publishing, I guess!